Looking to pack lot of experience into your break? Want to try somewhere that has many different sides just waiting to be discovered? How about Morocco? Situated just across the Mediterranean from the vibrant holiday resorts of southern Spain, the influence of Morocco’s European, Islamic African and North African neighbours has created a country with a rich, diverse character. Once part of French Africa, many Moroccans are fluent in French, along with their own dialects of Arabic, so knowledge of either language will make communication easy. Picking up a little of either will be very useful, as few Moroccans will know English and friendly haggling, particularly in marketplaces, is the norm. Often purchases will go for 50% below the asking price, so if you want your dirham to go further, get bargaining. Marrakech, the Red City, is a city of extremes that has some of the best sights, sounds, smells and tastes that Morocco has to offer. Lying between the jaw-dropping Atlas Mountains and the edge of the great Sahara desert, Marrakech is a bustling oasis in amongst this inhospitable but breathtaking scenery. For the more adventurous of us, treks can be organised for both. If you prefer something a little more relaxing, try a hammam, a steam bath where a rigorous scrub massage will leave you feeling refreshed. Be warned though: if you bathe with the locals be prepared to return the favour and give them a good scrubbing back! Feeling hungry? Moroccan food is hearty, mostly comprising of tajines, an aromatic stew of meat, vegetables and spices that is often served with couscous. You will find cafes offering these everywhere in the Marrakech souk (marketplace) along with more familiar European-influenced dishes and perhaps some more unusual local specialities. 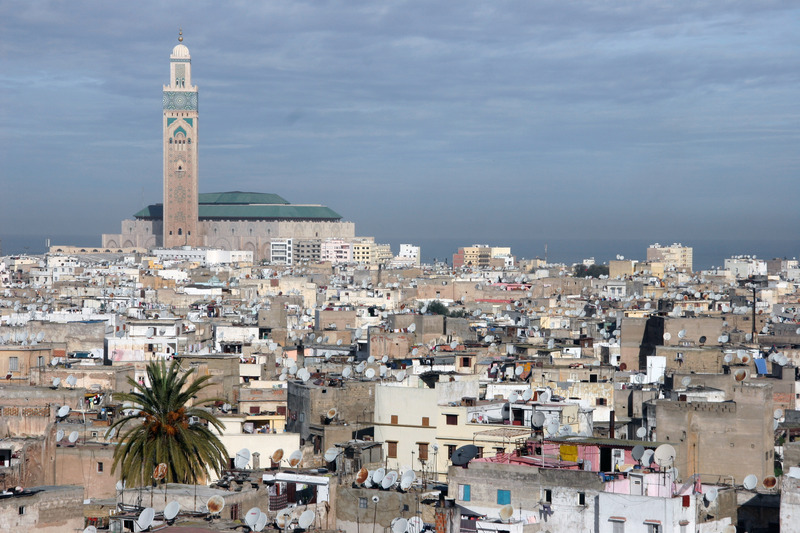 Casablanca (pictured), Morocco’s largest city, is also well worth a visit, and not just as an opportunity to make movie references. The cosmopolitan heart of Morocco, it is one of the most modern cities in the country and crammed with an eclectic mix of architecture, including the magnificent King Hassan II Mosque, one of the largest mosques in the world. Elsewhere, a variety of cafes and restaurants meld French, Spanish and local cuisines while clubs and bars provide a raucous nightlife unlike anywhere else in the country. As you might expect from such a westernised city, Casablanca is not the cheapest; but its unique vibe makes it a must-see, even if it is only for a day or two. If you desire something a tad more cultural, look no further than Fez. The ancient medieval city – as opposed to Tommy Cooper’s felt hat – will transport you back in time with no TARDIS required. It is the best preserved of its kind in the Arab world, and its medina (old town) is a labyrinth of market stalls selling exotic foods, dubious herbal medicines and the labours of master craftsmen with brass, leather, fabrics all made in workshops right before your eyes. The stunning mosaics and architecture of the city are beautiful, although they have perhaps not stood the test of time as well as the market industries they house. But this just adds to the mystical, well-worn identity of a city that time forgot. A place where Europe meets Africa, where snow-capped mountain ranges loom over vast deserts, where modern cities stand side-by-side with medieval market towns; Morocco has an astonishing amount to offer the curious traveller. A place that has integrated western culture and influence without compromising its own character, it is a satisfying experience for new travellers and seasoned adventurers alike.